You'll explore the less-touristy side of things at Jureia Beach and Fundacao Museu de Historia Pesquisa e Arqueologia do Mar. You'll enjoy a bit of beach vacationing at Praia da Baleia and Juquehy Beach. Get out of town with these interesting Guaruja side-trips: Maresias Beach (in Maresias) and Coffee Museum (in Santos). And it doesn't end there: enjoy the sand and surf at Enseada Beach, appreciate the history behind Praca da Independencia, and see the interesting displays at Fishing Museum. For reviews, maps, and tourist information, read our Guaruja holiday planner . 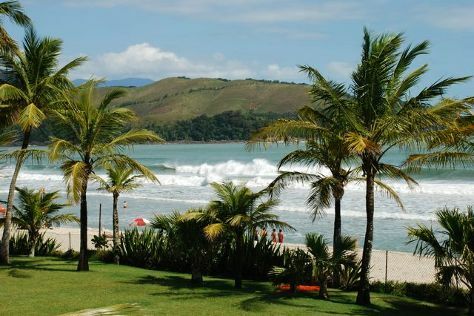 In January, daytime highs in Guaruja are 34°C, while nighttime lows are 26°C. Cap off your sightseeing on the 31st (Thu) early enough to travel back home.